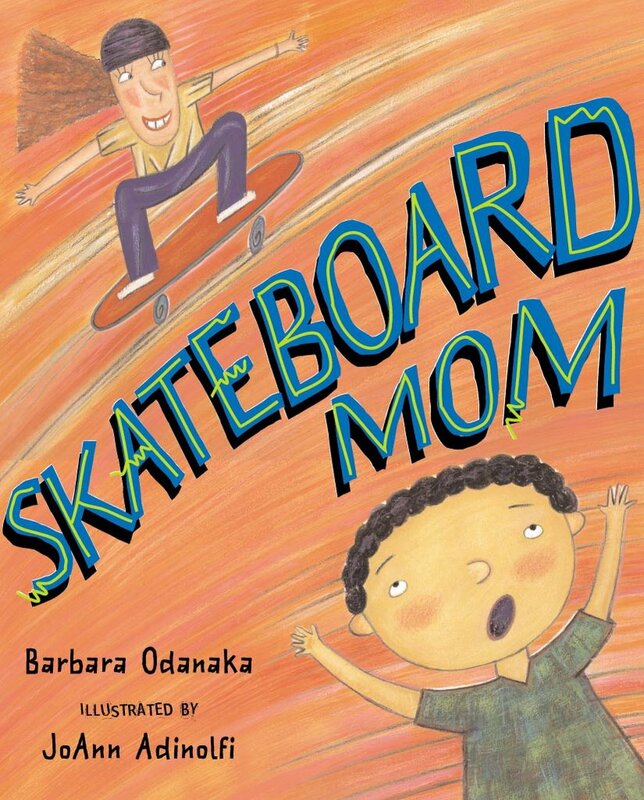 The life and times of Skateboard Mom, aka children's author and skateboarder Barbara Odanaka. Skateboard Cow is the main character from my latest book, A Crazy Day At The Critter Cafe. I'm having lots of fun with this when visiting schools and libraries and such. 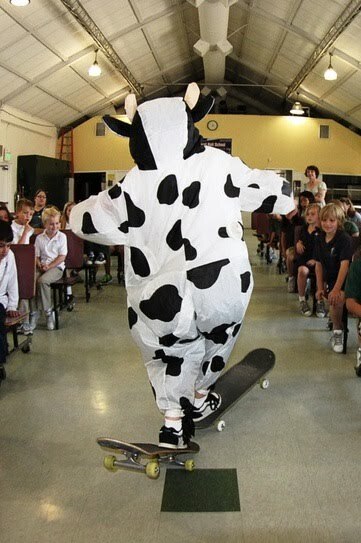 Anyone have an idea how to keep cool when skateboarding in a cow costume? I've had some wonderful experiences the past few weeks visiting schools in Washington DC; Manassas, VA, and various schools around Southern California. Most recently, I rolled down to San Diego where I was joined on stage by six-year-old skateboarding phenom, Bryce. We traded tricks and even performed a skateboard duet. Fun times! 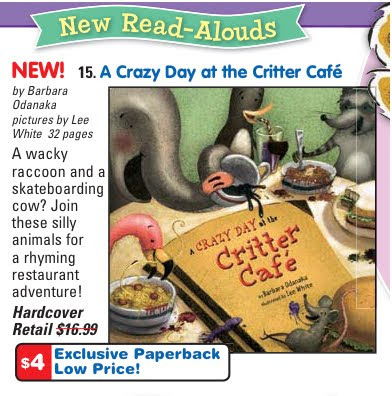 A Crazy Day At The Critter Cafe is one of the featured books for January 2010 in the Scholastic Book Club's Firefly catalog. Firefly is aimed at Pre-K student. The paperback book is just $4 (compared to $17 for hardcover). You can order this book through a school or directly from Scholastic Book Club, either by phone or online. Contact info below. Offer is good through March 22, 2010. 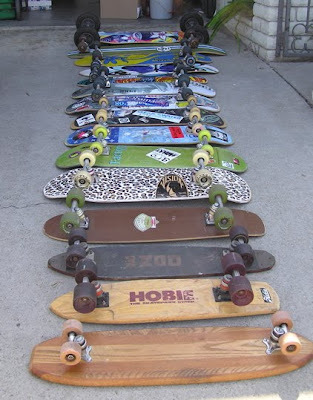 Whenever I give talks at schools, students often ask: "How many skateboards do you have?" I'm a little embarrassed to say I've lost count! Here's part of my collection from my 30-year obsession. They range from the Hobie Super Surfer (front board in second photo) the clay-wheeled wonder I received from Santa on Christmas Day, 1972, to my off-road Mountainboard (the one with the balloon tires). A Crazy Day is Born! 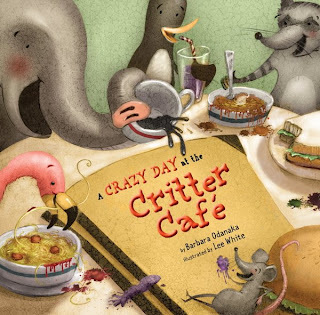 Today's the "birth" date of my third book, A Crazy Day At the Critter Cafe. Big thanks to my agent, Tracey Adams, my editors, Emma Dryden and Lisa Cheng, and of course artist Lee White for his fabulous illustrations! Here is the cover! The book comes out in June with Simon & Schuster's Margaret K. McElderry books. Illustrations by Lee White. 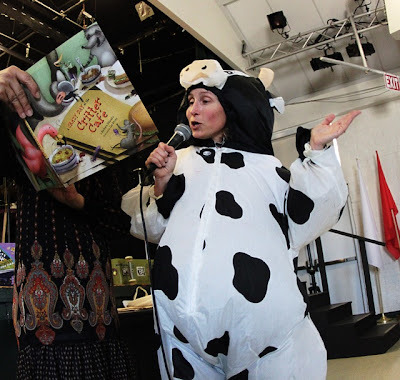 A Crazy Day At The Critter Cafe! 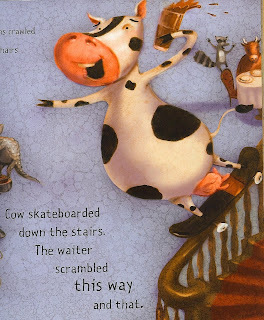 I'm very excited about my third children's book, due out in June with Simon & Schuster's Margaret K. McElderry Books. It's A CRAZY DAY AT THE CRITTER CAFE, and Lee White's illustrations are so much fun! The 2008 Mighty Mama Skate-O-Rama was a great success! Thanks to the generosity of our sponsors and all our ticket buyers, our Rockin' Raffle raised a record amount for our 2008 charity, Rosie's Garage. More than 35 women got on board for the event. Legendary skater Ellen Oneal (pictured above) was there as our official honoree. Smiles and stoke were plentiful! Scroll down for list of raffle prizes! Isn't it a beaut? BIG thanks to Jer Warren Graphic Design! FIVE decks from Cool Girls Decks! Gift certificates, decks and t-shirts from Jokers Skate Shop! A huge pile of wheels from PINK Skateboards! A mass of precision bearings from BiltIn! A $100 gift certificate to Mozambique Steakhouse of Laguna Beach! Sunday Brunch for Two at Balboa Bay Club, Newport Beach! Gift certificate to La Sirena Grill, Laguna Beach! Custom jewelry from Hoss Rogers! Gift certificates to Hennessey's Tavern, Laguna Beach! A longboard (compete!) from Sire Longboarding! Gift card from Hobie Sports, Dana Point! Dinner at La Fondue, San Juan Capistrano! Hundreds of dollars' worth of sportswear from Champion USA! Gift certificate to Tabu Grill, Laguna Beach! Gift certificate to 230 Forest Avenue, Laguna Beach! Gift certificate to Opah restaurant, Aliso Viejo! One hundred free meals from Wahoo's Fish Tacos! A gorgeous BAMBOO LONGBOARD with Indy trucks and Sector 9 wheels from Laguna Bamboo! Check back often to watch the prize list grow! 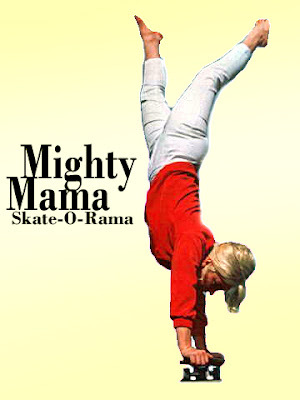 The nonprofit Skateboard Moms Inc. is proud to present their fifth annual charity event, the MIGHTY MAMA SKATE-O-RAMA™, Sunday May 11th (Mother's Day) at the Laguna Niguel skateboard park in Orange County, Calif. 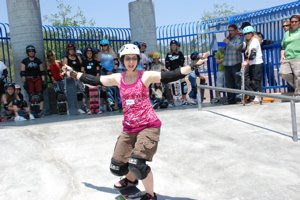 The MIGHTY MAMA SKATE-O-RAMA™ is party on wheels for Women Who Dare To Have Fun. The event features skateboarding women of all ages and abilities, in a non-competitive, family-friendly atmosphere. You don't have to be a "mom" to participate--all women are welcome, along with any and all supporters, male or female, young or old. The action begins at 10 am, with introduction of the Skate Moms at 11 am. As always, this year's event will feature another Rockin' Raffle of great skate gear and other cool goods with proceeds benefitting La Habra-based Rosie's Garage, an afterschool program for kids in need. 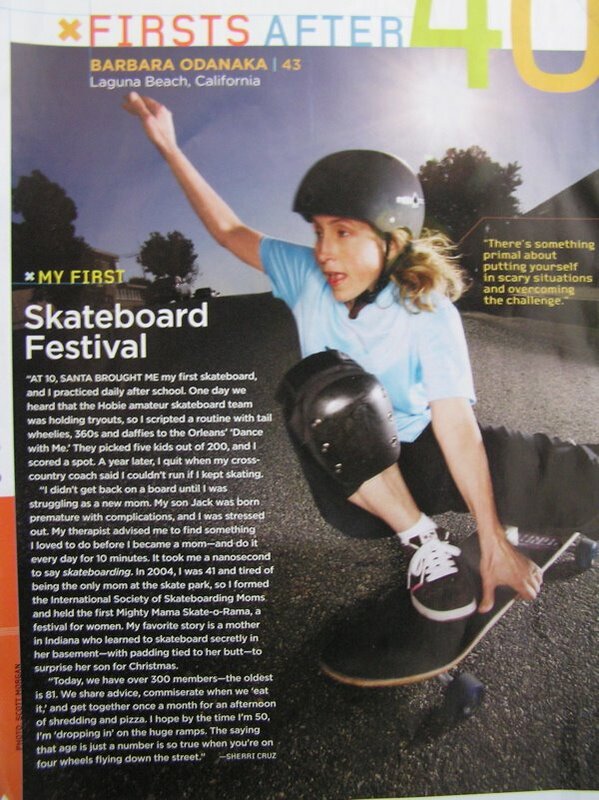 The Skateboard Moms and the MIGHTY MAMA SKATE-O-RAMA™ have been featured in over 200 media outlets including Good Morning America, The Early Show, ESPN2, Fuel TV, USA Today, Los Angeles Times, Miami Herald, Boston Globe, National Public Radio, BBC Radio and many more. The 20,000-square foot Laguna Niguel skateboard park is located at 27745 Alicia Parkway in Laguna Niguel, CA. The skatepark charges a $10 daily fee (or $60 for an annual pass) and requires full safety gear (knee pads, elbow pads, helmet) and a signed liability waiver. 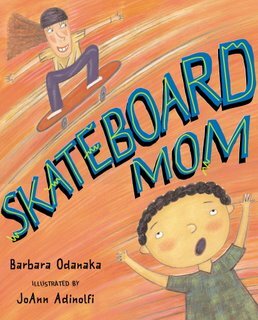 For more information on the Skateboard Moms or the MIGHTY MAMA event, contact Barb Odanaka at barb@skateboardmom.com. 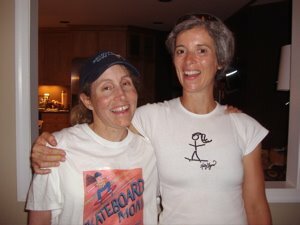 For ongoing updates, please check www.skateboardmom.blogspot.com or www.myspace.com/skateboardmoms. A BIG thank you to the folks at Valencia and Tulita elementary schools, where I visited last week. Both schools really stood out for attentive, enthusiastic crowds and fun and helpful staffs. 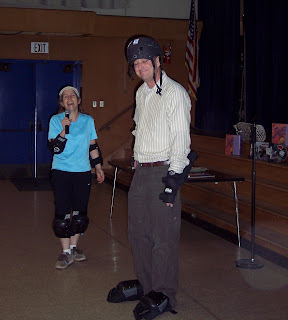 Kudos to both school principals who took Skateboard Mom's introductory skateboard lesson and showed the kids just how it's done! The 2007 Mighty Mama Skate-O-Rama was a big success! 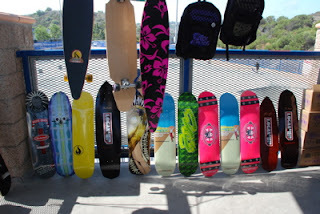 Nearly 40 women and their families showed up at Laguna Niguel skatepark to celebrate Mother's Day and we raised nearly $1,400 for Rosie's Garage. A HUGE thanks to our many, many sponsors who contributed raffle prizes, goodie bag treats and funds to comp the participants' skatepark entry fees. Next year's Mighty Mama event will be held on Sunday May 11th. Hope to see you then! 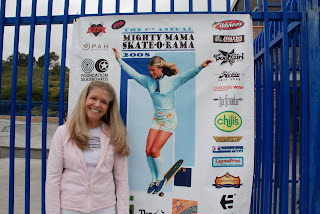 The 2007 MIGHTY MAMA SKATE-O-RAMA™ is coming up on Mother's Day, Sunday May 13 at the Laguna Niguel Skatepark in south Orange County, CA. 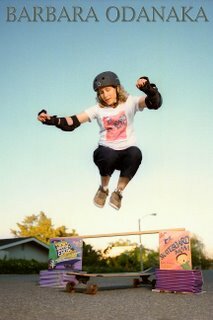 The MIGHTY MAMA SKATE-O-RAMA™ features skateboarding women of all ages in a non-competitive, family-friendly atmosphere. You don't have to be a "mom" to participate--all women and their supporters (male or female) are welcome! Action begins at 10 am, with introductions of the "Skate Moms" at 11 am. 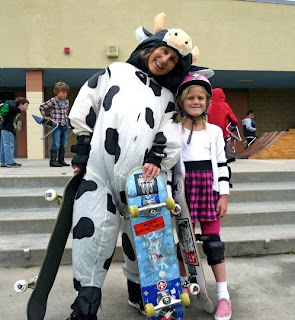 As always, our Rockin' Raffle of skate gear and other cool prizes benefits children's literacy programs--this year's beneficiary is Rosie's Garage, a La Habra-based grassroots tutoring/mentoring organization for kids in need. Our raffle loot includes $5,000 worth of prizes so far! Don't miss out! Prizes include brunch for four ($300 worth!) at the luxurious St. Regis Resort in Monarch Beach, LOADS of cool decks and completes, hundreds of dollars worth of dinners at local restaurants, a "Skate with A Pro!" birthday package ($750 value!) with pro skater MIKE OGAS, a private tour of ABC BOARD SUPPLY skateboard factory, and much, MUCH more. 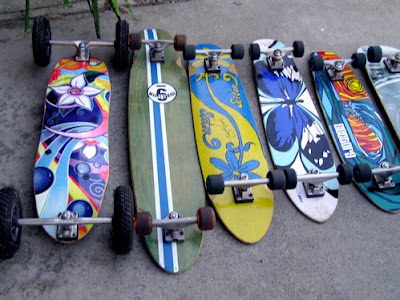 This just in: GRAVITY SKATEBOARDS has donated EIGHT skateboards (plus wheels, DVDs, tees)!!! 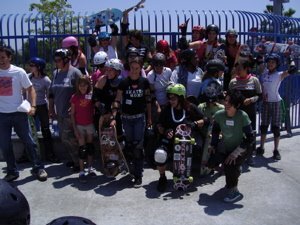 New this year: Thanks to the generous support of FANATIC Skateboards, SANTA MONICA AIRLINES Skateboards and WICKED WAHINES, the first 40 women (age 18+) to enter the skatepark will have their $10 skatepark entry fee comped! Check out our amazing list of raffle prize contributors! Raffle tickets are $1 each and purchasable starting at 9:30 AM on day of event. Raffle ticket sales will go on throughout event. Drawings will be held throughout the day. All proceeds benefit Rosie's Garage, a not-for-profit tutoring and mentoring center for kids in need in North Orange County! IMPORTANT: The Laguna Niguel skatepark requires full safety gear, a $10 entry fee and signed liability waiver (if you're under 18, the waiver must be signed by parent or legal guardian). Click here for waiver. 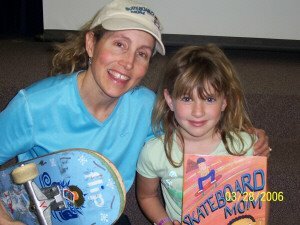 The Skateboard Moms highly recommend lessons for beginners! 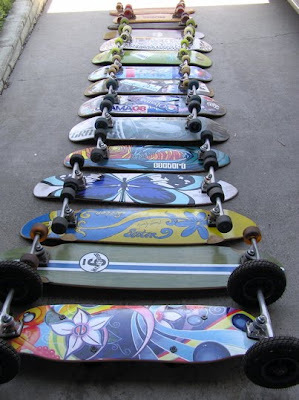 Contact skatepark for lessons in advance by calling (949) 916-7755. PARKING: There is a small parking lot at the skatepark, and a larger one 100 yards away adjacent to the soccer fields. If you still can't find parking, the Federal Building across the street (on east side of Alicia Pkwy.) has granted us a permit for overflow parking in Lot "L." Please use crosswalks! Do not play chicken with the cars here--it's deadly! Do not park directly on Alicia Parkway as your car will be towed. I really enjoy visiting schools, but lately the fun factor has really increased. A few weeks ago, I had the pleasure of visiting Roynon Elementary in La Verne, a cute "small town" east of Los Angeles. I go to a lot of schools, but this one had such a positive energy--from the teachers to the students to the custodian--I found I was smiling long after I left. One of the perks of my job is getting to know lots of interesting characters. Not just from my books, but the real-life people I meet at schools, libraries and bookstores. At Roynon, Principal Jim Symonds struck me as perhaps the most mellow school principal I've ever met. 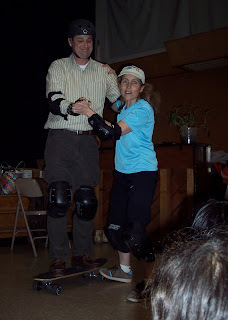 Here is he gamely participating in a "skateboard lesson" from Skateboard Mom. You're a good sport, Principal Symonds! Lots of fun events and appearances coming up! California Readers luncheon (Feb. 24), Family Festival of Books at Chino Fairgrounds (Feb. 25), Roynon Elementary (Feb. 27), Newport-Mesa Author Festival and Lincoln Elementary (March 8), Ekstrand Elementary in San Dimas (March 23) and Murrieta Elementary (March 27). Please join me on Wednesday, Jan. 24 at THE FIRST PAGE bookstore in Newport Beach, CA. I will be reading and signing my latest book, Smash! Mash! Crash! There Goes the Trash! The event begins at 10 am. For details, please visit www.thefirstpage.net or call the store at (949) 644-5437. My latest children's book, Smash! Mash! Crash! There Goes the Trash! is now available in bookstores and online. Illustrated by Will Hillenbrand, Smash! Mash! Crash! 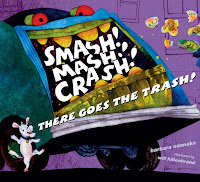 is a rhyming picture book for the young trash truck lover in your life. The reviews have been excellent. SMASH! MASH! CRASH! THERE GOES THE TRASH! By Barbara Odanaka will prove a delight for any child, urban or rural, familiar with the early wake-up call of the garbage truck. A rhythmic and noisy text filled with appealing sounds follows two garbage trucks on their route - and dogs, pigs, and more who can't wait for them to arrive! Perfect for read-alouds. 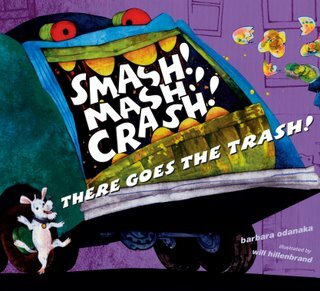 Another book about garbage trucks? Well, yes, but instead of focusing on a swaggering, loudmouthed vehicle, as Kate McMullan does in I Stink! (2002), this book stars a couple of pigs. Leaping out of bed early in the morning, the pigs watch two garbage trucks groaning, gobbling, and grinding as they make their noisy rounds. Hillenbrand's textured illustrations, in egg tempera and ink on canvas, depict the machines as giant, mechanical toads on wheels. The midnight-blue background gradually lightens to cream as daylight comes and the garbage workers (also pigs) pick up their loads, including cast-off furniture and dirty diapers. After the big buildup, the end is rather tame, but the rhyming text is as descriptive as the art ("Gooey, gloppy. / Slimy, sloppy. / Truck's a rolling bug buffet. / Flies a-buzzin' by the dozen-- / lapping up that cheese souffle"). The antics of three dogs drooling after the trucks in anticipation of fallout extend the comedy. PreSchool-Grade 1–Rhythmic, rhyming language abounds as two piglets welcome the early-morning arrival of a pair of Rumbling, roaring garbage trucks. All of the offal details are here as the green behemoths gobble up everything from apple cores and dirty diapers to broken furniture. Smiling porcine workers, with Greasy gloves…sticky boots…/stains a-plenty on their suits, feed the beasts while Flies a-buzzin'/by the dozen enjoy a feast at the rolling bug buffet. After completing all of the Crushing,/cramming,/screeching,/slamming, the vehicles thunder away, leaving the youngsters to re-create the action with their toy replicas. Done in ink and egg tempera on canvas, the vivacious two-page paintings convey the text's enthusiasm and energy. The trucks, shown from the rear and personified with mouthlike hoppers and red brakelight eyes, gleefully munch their way through an array of vividly colored refuse. The pigs are appealing, and readers can follow the antics of their dogs as they rush outside to be part of the fun. Pair this onomatopoeic offering with other tongue-tingling read-alouds, such as Kate McMullan's I Stink! 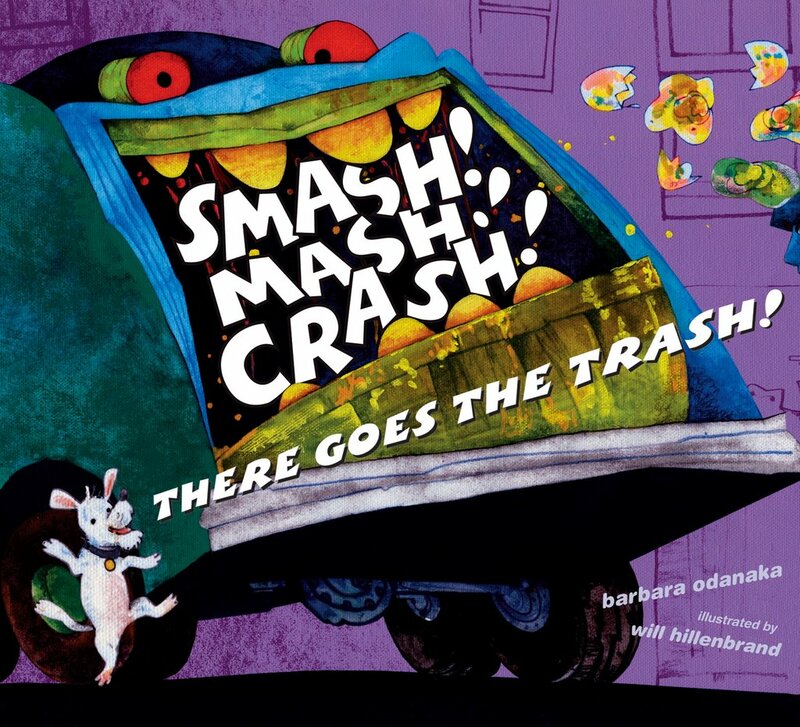 (2002) and Andrea Zimmerman and David Clemesha's Trashy Town (1999, both HarperCollins), for a crash-bang storytime on a perennially popular topic. Big thanks to Peter Mounier of Mounier Giclee in Morro Bay, CA for blowing up Ralph Palumbo's photo of me into poster size. Peter is a whiz with the giant scanner! Below: Patti and I in our post-skate delerium! 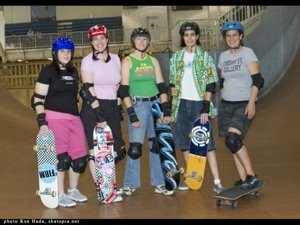 Calling all East Coast skate women (you don't have to be a "mom" to roll with us): the next Mighty Mama Skate-O-Rama will be on Sunday, August 13th in the Washington D.C. area. We will meet at 2:30 pm at the Wakefield Skatepark in Annandale, VA (skating starts at 3 pm). The skatepark is located at 8100 Braddock Rd. 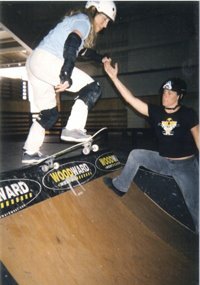 in Annandale, VA.
Wakefield Skatepark is offering a special discount rate of $4 for women 18 years old and up. The skatepark rents helmet, elbow and knee pads for $5/day (the Skate Moms highly recommend wrist guards, too, but the skatepark only has a few pair so bring your own). Please wear full safety gear and SKATE AT YOUR OWN RISK! Novice lessons, compliments of the International Society of Skateboarding Moms, available on a first-come, first-served basis. After a couple hours at the skatepark, we'll grab some grub then move on to an (as of yet) unspecified spot in D.C. for our Rolling for Reading book campaign. This is where we skate while handing out books to kids. My publisher, Putnam, very generously donated several boxes of new children's books for this roll-out. Yea Putnam! If you'd like to participate on this roll-out, please bring a backpack in which to carry some books. If you have new or GENTLY used books you'd like to bring a lot to contribute, by all means do. From the Beltway, take Exit 54-A West, skatepark is approximately one-quarter mile off the Beltway at 8100 Braddock Rd. in Annandale, VA. Phone (703) 321-7081. Please check back here for updates (especially the morning of the 13th, just in case!). Well, Sunday, May 14 was one awesome day indeed. 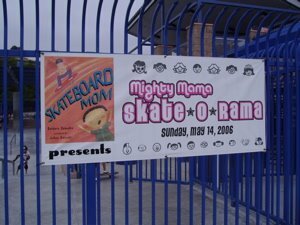 The 2006 Mighty Mama Skate-O-Rama was so much fun, I wish Mother's Day came twice a year. Nearly 30 moms and "aunties" came out for the celebration at Laguna Niguel skatepark along with many, many supporters. Particpants included Isabelle C., Amy B., Kristin M., Wednesday A., Melissa S., Patricia M., Maureen F., Mandy E., Nellie J., Tracey S., Rose B., Gale H., Sharie L., Patrice G., Jaime S., Tamara M., Quynn L., Sheila K., Elaine N., Vicky O., Ji H., Christy N., Dawn C., Karena G. and me. A special moment, for me personally, was the arrival of my parents, Orlando and Dorothy. My dad, who decades ago drove my friends and I all over kingdom come looking for cool skate spots, is now wheelchair bound due to a stroke three years ago, but I still saw a flicker of happiness in his eye when I jumped on my board and did a few skate tricks for old times' sake. Gravity, Fanatic, Skaterbuilt, Van's, etnies, Skatelab, Pro-Tech, Bell, Judi Oyama, RockinRonsRockets, Justin's Custom Bags, Backleash, Tum Yeto, Curly Grrlz, Barnes & Noble, Diedrich's Coffee, Chili's, BJ's Pizza, Champagne Bakery, HB Wahine, Infinity Boardshop, artist Gale Hart, Sempson Graphics, Vitamin Water, Maggiano's, Sk8kleen Soap, pro skater Mike Ogas, Sk8supply.com, Connie's Skate Place and many others! A huge thank you to Master of Ceremonies Dan Hubbard of Stunt Teams for doing his always awesome job (third year in a row, yea!). Big thanks to to all the volunteers, especially Kristin M. and her brood, for helpful service. Next up: the Eastern Mighty Mama Skate-O-Rama in Washington D.C. on Sunday Aug. 13th. Details TBA. Mighty Mama Skate-O-Rama May 14! We are one day away from our big annual event! We have one awesome raffle this year (with all proceeds going to the library at Orangewood Children's Home). If you're around Laguna Niguel, CA, please come by to watch and/or buy some raffle tickets to support the cause! Tickets are $1 each or 25 tickets for $20! 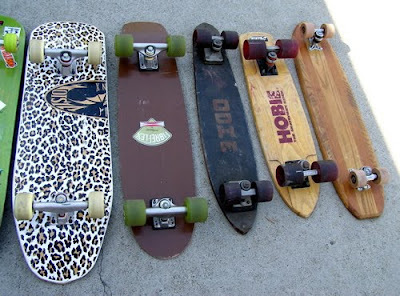 Fanatic Skateboards (6 decks in three sizes). Check out the May issue of Ladies' Home Journal, a magazine I never expected to find my way into! Freelance writer Stephanie Stephens did an excellent job, and I was really impressed by the fact checking crew at LHJ. They went over each and every detail! Page 150 of the May 2006 issue if you're interested. Thanks to some wonderful generosity on part of our many sponsors, the raffle for the 2006 Mighty Mama Skate-O-Rama looks to be the best ever. 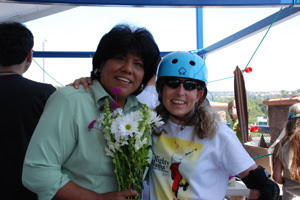 The event, held on Mother's Day, Sunday May 14, at Laguna Niguel skatepark, raises money for the library at Orangewood Children's Home for neglected and abused youth. Prizes to be raffled off include 20 pair of skate shoes from Vans, 10 pair from etniesGirl, six decks from Fanatic Skateboards, two decks and three sets of big, groovy wheels from Gravity Skateboards, decks from Curly Grrlz Skateboards and Skaterbuilt, RocknRonsRockets skateboard bearings, a whole lotta T-shirts from Tum Yeto, Sk8kleen soaps (shaped like skateboard wheels! ), private skateboard lessons with pro skater Mike Ogas...and much more. Check out www.skateboardmom.com for details. Members of the International Society of Skateboarding Moms typically grin as they spin--having fun, of course, is a top priority. 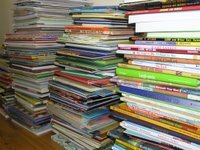 But the club also tries to give back with our Rolling for Reading program, which puts new and gently-used children's books into the hands of kids in need. We distribute the books on skateboards, of course! 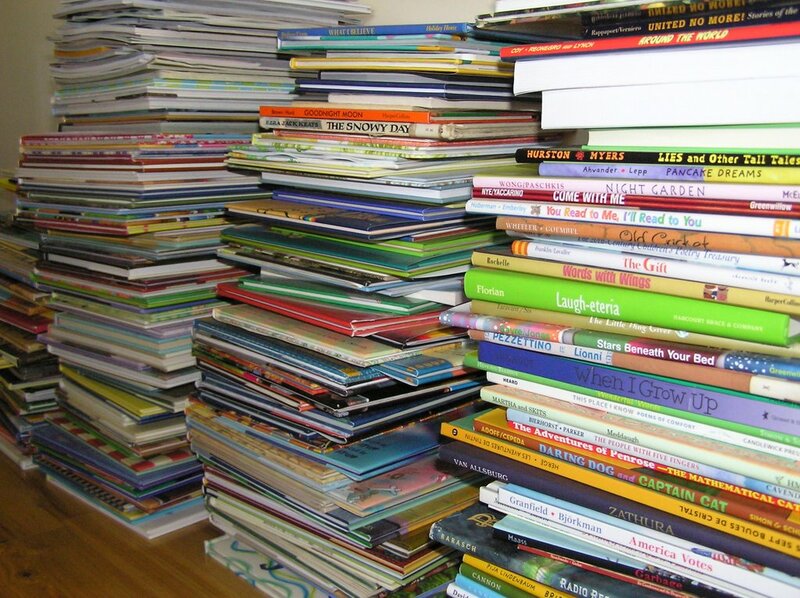 I currently have a very large stack of books in my living room that will be donated to the Orangewood Children's Home after the May 14th Mighty Mama Skate-O-Rama. Normally, we try to roll out books to kids every other month. If you have some new or very gently used children's books you'd like to donate, or you're a skateboarder with a little time on your hands and goodwill in your heart, please contact me. This is my cat, Leopard. 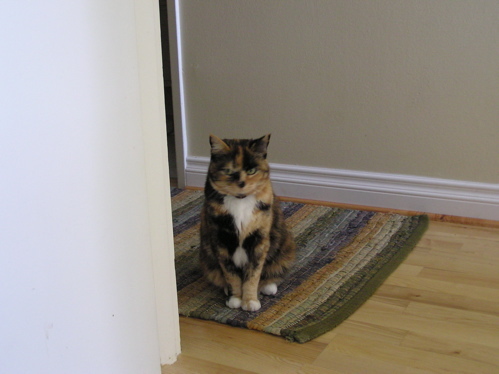 She keeps an eye on things. She growls like a dog, but is as fierce as her namesake! 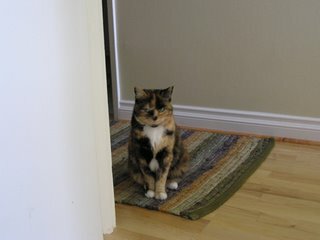 She specializes in sneak attacks, but at night, she curls up like a furry bowling ball and keeps our bed nice and warm. Sherri Cruz did this profile of me for the April 2006 edition of More magazine, geared toward women over 40. One thing's for sure, magazines really do know how to make you look younger (make up, lighting!). 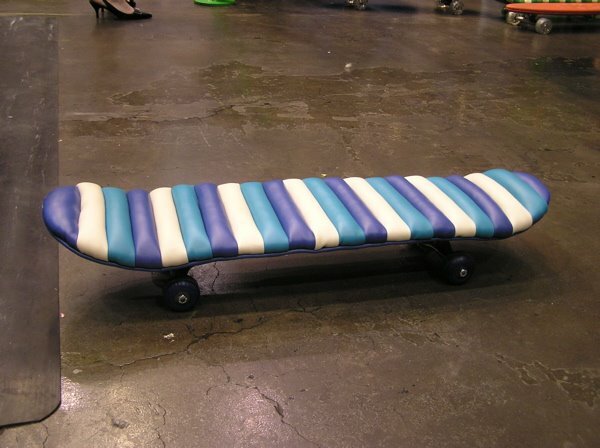 Spotted this vinyl, upholstered skateboard at the CA Boom modern home expo in Santa Monica last weekend. Perfect for barefoot skating! 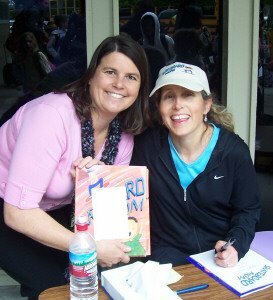 Last week, I had the pleasure of doing an all-day author visit at George White Elementary School in Laguna Niguel, CA. 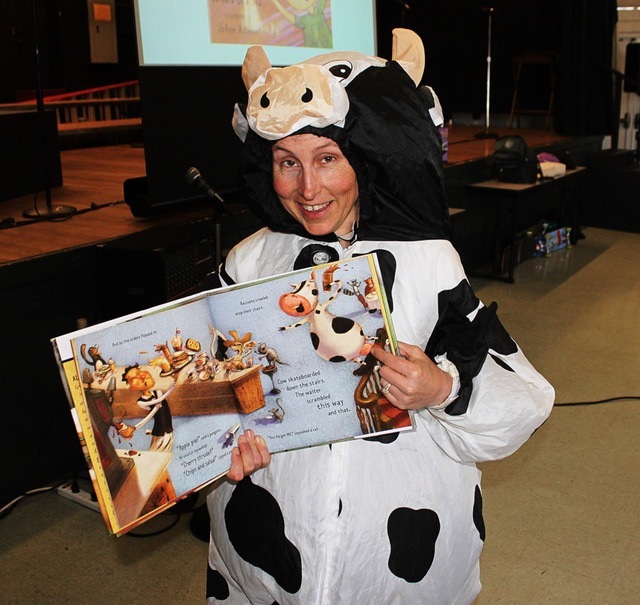 I have done about 30 school visits in my career, and I must say this was one of the very best. The George White Knights really know how to treat an author! First, they had a reserved parking spot waiting for me when I drove up. This is a very big help when you're lugging a half dozen skateboards and other props into a school! Second, from the moment I walked into the front office, all the teachers and staff members knew who I was and why I was there. Big smiles all around. This really makes a visiting author feel welcome! Plus, I can tell the school did a great job in generating enthusiasm about my visit. Kudos! Third, the students were not only primed and ready, they were super psyched! 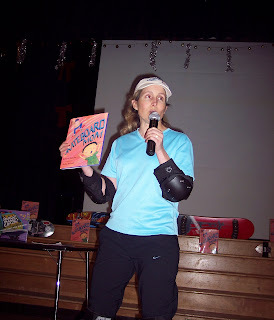 I have done presentations at schools where the students had never heard of me, or my book, until the moment I was being introduced. Such a pity! At George White, it was obvious that the kids had not only heard of me and read my book, some had actually memorized a few lines. Wow! I could go on and on (a tasty lunch! enthusiastic helpers!) but the bottom line is, this school went out of their way to make the whole experience one the students won't soon forget. 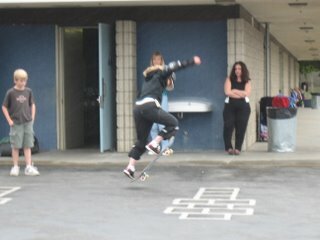 And I'll never forget the entire student body sitting out in the rain, chanting "Skateboard Mom! Skateboard Mom!" as I did my finale of skateboard tricks. Thank you George White Knights! 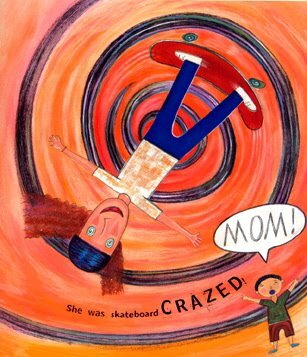 And special thanks to Jill Brick, Susan Riley, Susan Suhr, Mrs. Koci, and of course Principal Spelber for being brave enough to take a beginning skateboard lesson from Skateboard Mom! Hi all. After a year, I'm finally getting around to write on this blog. So here's an update.